As with all the tutorials in the Friesen Project, please remember that these tutorials are done in an abbreviated format, with Christi Friesen’s expressed permission. These tutorials are written and designed to be used in conjunction with the Beyond Sculptures Book 5: Down Under. Making my Parker Aborigine styled art was so much fun. 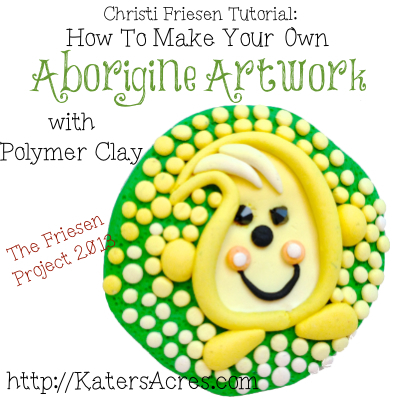 Today using the help of Christi Friesen’s “Beyond Sculpture Series Book 5: Down Under” I am going to walk you through all the steps of creating your own Aborigine styled art using polymer clay. Detailed instructions for creating Aborigine inspired art can be found in Down Under by Christi Friesen on pages 26-39. The first thing in any project is to make your background. I wanted Parker to be on a green background that looked like grass. So I took a lump of green, added orange, white, a pinch of black, and gold and marbled it together to a intricate blend where no pure colors could be seen. Then I flattened the base into a shape that I wanted, which was a quasi-circle (which to me means it looks like an imperfect circle formed by nature in a cave long long ago … quasi-circle … yep). I then took a piece of wire, made loops on each end, bent the wire and added clay “dots” over the wire to secure it. Christi’s book gives great instructions for both focal beads and pins, but I really wanted a wall hanging for my studio. As I always instruct, it is best to come up with your design first. If you can’t think of any design ideas, feel free to use the 6 or 7 example that Christi gives in her book. Or, as I stated above, do a quick Google search for Aborigine art. Once you have your main design element, draw it on your background and then make snake of clay to draw your general shape. In traditional Aborigine styled-art fashion add little “dots” all over your project. You might notice that for my project I went with a skinner blend and made Parker in an “Ombre” color with lighter “dots” at the bottom and yellower dots toward his peak. I also filled in my Parker silhouette by cutting the shape of Parker from my skinner blended sheet. Now have some fun, add features to your design including eyes, limbs, and fingers. Then finish surrounding your design with dots of clay. Not just any dots of clay, but get dot-tastic and have some fun. Use rice beads, pearls, crystals, or any other kind of bead you’d like to add texture and a pop of surprise. Remember when using beads to follow this technique to embed them into clay so they don’t pop out. When you are done decorating your Aborigine design, pop it in the oven and bake it at the clay manufacturer’s recommended time and temperature. When your design is done, give him an antique finish. Get a complete guide to adding an antique finish (or patina) here. For my project, I personally liked Parker much better before he was antiqued. With the dots being so close together, it is next to impossible to lift all the paint. This made Parker grungy looking. But still cute. I had a lot of fun with this and did NOT do something from “Down Under” but rather my own design … do something of your own and make this technique and project truly yours, truly one of a kind. Please note: Parker© is a copyrighted character. Please do not reproduce Parker without my expressed permission. Thanks! Hi Astrid – Thanks for the compliments on antiqued Parker. I’m still trying to get used to his “cave man” wear style. I do NOT let my paint dry, I wipe it while it is still wet. If you let it dry it’s virtually impossible to get off. When I’m done painting it and varnishing it though, I DO pop it back into the oven at 200 degrees for 10 minutes to help seal it.